Just the two of us, we can make it if we try. Just the two of us…. I’ll change the word from “two” to “three” and hum it for four straight days. I really want to attend a very special event on Saturday. Doodle Dad cannot come with me. So I’m driving solo and taking both Doods with me. It’s a 7.5 hour drive, one I’ve done dozens of times before. But never as the only human in the car with two dogs. Wanting to make this trip a happy and safe experience, I looked at a few articles for some tips. 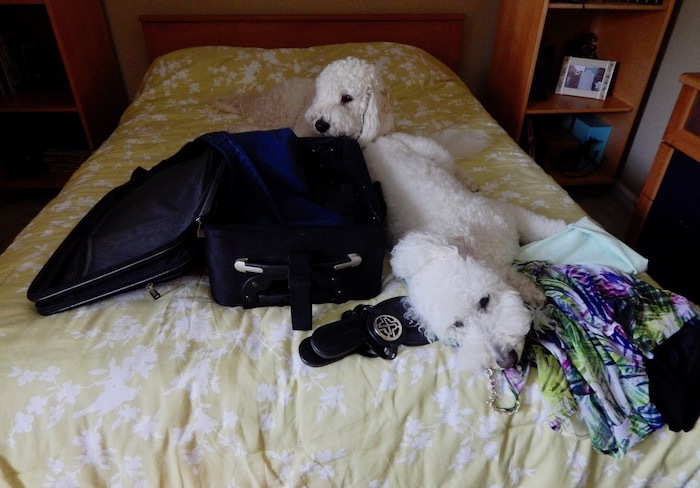 Read an excellent article by Amy Burkett of Go Pet Friendly on Tips For Traveling Alone With A Pet. Most of the tips I’d already thought about. Carry safety devices #justincase – since I am traveling alone, I should have some assistance (mace, safety whistle, pepper spray) from unwanted advances from strangers, aggressive dogs, or even wildlife. I learned a few steps to ensure that they will be comfortable for the short period of time required. park your car in the shade. place a sunscreen across the windshield to decrease visibility that they’re in there. set my cell phone alarm for 10 minutes and make sure I’m back before it goes off. There’s nothing better than hearing from people who have already driven a mile in the direction you’re headed. Has anyone traveled a lengthy distance alone with their dogs? Can you think of anything else I haven’t shared that I need to know? I can’t wait to start our adventure in a few days. Look for live video on their FaceBook page throughout the weekend. 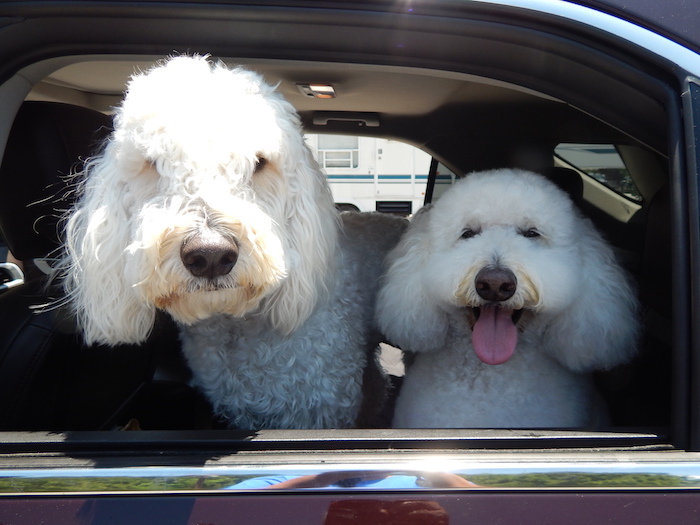 Especially their Doodle Reunion on Monday. The furthest I’ve travelled with any of my dogs was from Long Island, NY, to Greenville, SC, back in 1993; but I wasn’t the only human. I had Sam (then my fiancé) to share the drive with and only one dog – my toy poodle, Kissy. We drove from LI to Arlington, VA, the first day and spent the night at my brother’s house. The second day we drove to Greensboro, NC, where I had work friends and spent the night at a Red Roof Inn. And the third day we completed the trip by arriving at Sam’s house which then became Our house. We took turns using facilities en route, but Kissy was a good traveler anyway as I had always taken her on day trips on the weekends when she was a pup and young adult. I remember taking this trip with only Harley, and it wasn’t bad, I was anxious to see what it would be like with Jaxson also. Will write my follow – up review this week, stay tuned…. Hi Mary-Ann, I wish I could have. I left at 3 in the morning because I had an afternoon event to get to. But thanks for sharing that information with me. My mom says the best road trips are with just her and us dogs. It is a ton of fun, and we are all together. Mostly we travel separately, not usually all three of us come along, but it is just as much fun. Enjoy. Safe travels! You are a brave woman. I’m sure the 3 of you will have a wonderful adventure. I look forward to your videos. I will admit for a fleeting moment when I left the house in the middle of the night I was re-thinking the whole trip. So glad I stayed on course. We had a blast. Have a pawsome and safe trip! No doubt you’ve got everything covered. Thanks so much Monika, it was a lovely adventure, more to come later…. Sorry you don’t have a wing woman to help with the restroom breaks. When I’ve soloed with Honey, I’ve been known to yell into a rest stop restroom, “I am coming in with my dog, does anyone object?” No one ever has. And they have those handy hooks on the back of the door for leashes. If you’re traveling with two, you want to make sure you wait for the handicapped restroom to be free. Safe travels. Hope you have a great time. The weather was very accommodating, I ran in and out of the restroom w/o putting them in jeopardy of being left in the car. We had a blast, more info to come…. Should be an interesting…but fun trip! Safe travels Cathy. If anydoodlemom can do it, that is definitely you! Have a pawsome time with the Boys! Pedro and I look forward to hearing (reading) all about it! I’ve never done a road trip with my dogs, but it sure sounds like fun! We hope you have a very safe and fun trip, and good job doing your research ahead of time. 1, 2, 3, just the Doodles & Me!! I’m envious of your trip, I bet it’s a great one! Thanks for sharing these super important safety tips, these are great. I haven’t done long road trips as the only human, but I like to stick to main interstates vs the scenic routes if possible & I avoid driving after dark. My car happens to have tinted windows in the back which helps a lot, from living in Phoenix where it’s a must. Can’t wait to hear all about it!